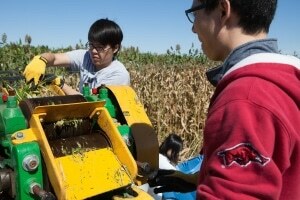 A new study by a multi-institutional team led by the University of Illinois claims that sugarcane can be genetically engineered to create oil in its stems and leaves for biodiesel production. Also, the modified sugarcane plants produced more sugar, which then could be used for ethanol production. These dual-purpose bioenergy crops are projected to be over five times more cost-effective per acre than soybeans and two times more cost-effective than corn. More significantly, sugarcane can be cultivated on marginal land in the Gulf Coast region that does not support good soybean or corn yields. Instead of fields of oil pumps, we envision fields of green plants sustainably producing biofuel in perpetuity on our nation’s soil, particularly marginal soil that is not well suited to food production. Long heads the research project Plants Engineered to Replace Oil in Sugarcane and Sweet Sorghum (PETROSS) that has initiated this study at the Carl R. Woese Institute for Genomic Biology at Illinois. This paper, published in Biocatalysis and Agricultural Biotechnology, examines the project’s first genetically modified sugarcane varieties. The researchers extracted approximately 90% of the sugar and 60% of the oil from the plant using a juicer; the juice was fermented to create ethanol and later treated with organic solvents in order to recover the oil. The team has patented the technique used to separate the sugar and oil. From two of the modified sugarcane varieties, they were able to recover 0.5 and 0.8% oil, which is 67% and 167% more oil than unmodified sugarcane, respectively. “The oil composition is comparable to that obtained from other feedstocks like seaweed or algae that are being engineered to produce oil,” said co-author Vijay Singh, Director of the Integrated Bioprocessing Research Laboratory at Illinois. We expected that as oil production increased, sugar production would decrease, based on our computer models. However, we found that the plant can produce more oil without loss of sugar production, which means our plants may ultimately be even more productive than we originally anticipated. So far, PETROSS has engineered sugarcane with 13% oil, from which 8% is the oil that can be turned into biodiesel. According to the project's economic analysis, plants with only 5% oil would generate an additional 123 gallons of biodiesel per acre compared to soybeans and 350 additional gallons of ethanol per acre compared to corn. At present, the project is looking for commercial investors to attain 20% oil production, the theoretical limit consistent with the project’s computer models. The research paper “Evaluation of the quantity and composition of sugars and lipid in the juice and bagasse of lipid producing sugarcane” is published by Biocatalysis and Agricultural Biotechnology. Co-authors include: Haibo Huang (Virginia Polytechnic Institute and State University); Robert A. Moreau (USDA/ARS); Michael J. Powell (USDA/ARS); Zhaoqin Wang (University of Illinois); Baskaran Kannan (University of Florida); Fredy Altpeter (University of Florida), and Aleel K. Grennan (University of Illinois). The PETROSS project and this research are supported by the Advanced Research Projects Agency-Energy (ARPA-E), which funds primary research for high-impact energy technologies to exhibit proof of concept before private-sector investment.